KFA – Level measurement solutions. We design and produce innovative level sensors and remote level monitoring solutions. More than just another sensor supplier. KFA was established by a team of very experienced engineers with a long track record in level measurement. We set out to establish a flexible, customer-oriented, boutique level measurement company. We are more than just another device manufacturer – we are your partner and strive to thoroughly understand your applications and specific level measurement requirements. Our goal is to provide an effective, custom-fit solution for each unique situation. You can count on us to craft the specific solution you need or tell you where you can find it. Because we are a boutique company with little overhead and efficient operations, we are able to offer high-quality, customized services at a very competitive price. We design and produce innovative level sensors and remote monitoring solutions. After unsuccessful attempts with other technologies, our clients turn to us for custom-fitted solutions for their level measurement applications. We specialize in solving even the most complex problems at a reasonable cost. Let us work with you to find a solution and get the job done. We are a small company of level measurement experts that have the passion and knowledge to analyze your applications in detail. We work closely with our customers, advising them about suitable products and helping them select the right options. We provide clear installation instructions and thorough system configuration support, ensuring that your system is installed correctly and works reliably. High-tech products with practical benefits. Our sensors utilize Time Domain Reflectometry [TDR] technology, also known as Guided (Wave) Radar [GWR]. 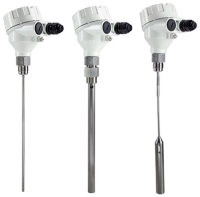 It is one of the most modern and by far the most versatile in the field of level measurement. It enables us to build sensors that outperform other devices that are based on traditional measurement technologies, such as capacitance, conductive, and ultrasonic. TDR level sensors allow very precise, inexpensive and highly reliable continuous level measurement in almost every liquid and most bulk solid. No moving parts, no wear and tear. No calibration in the field required. Independent of process conditions. Changes in the chemical and physical properties of the measured substance do not affect the sensor. Works in a vacuum. Exceptional performance in liquids with low dielectric constant, such as petroleum products and oils.